2018 was a big year for Tudor, with the beloved Swiss brand launching two watches in particular that set the hearts of watch-heads racing: the Black Bay Fifty-Eight, a classically-sized take on Tudor’s signature Black Bay diver; and the Black Bay GMT, a true GMT sport watch with a Pepsi bezel. Unsurprisingly, the Fifty-Eight took home the lion’s share of the praise, but the GMT was a major move for Tudor, and an interesting one at that. Unlike much of the rest of the Black Bay line, the GMT does not pull from any historical Tudor reference. Where it does pull inspiration is the iconic Rolex GMT-Master and Master II. Rolex, of course, is Tudor’s older brother, but Tudor (in its modern incarnation) has charted a separate path from the Crown, with a real focus on honing in on a distinct Tudor design language. 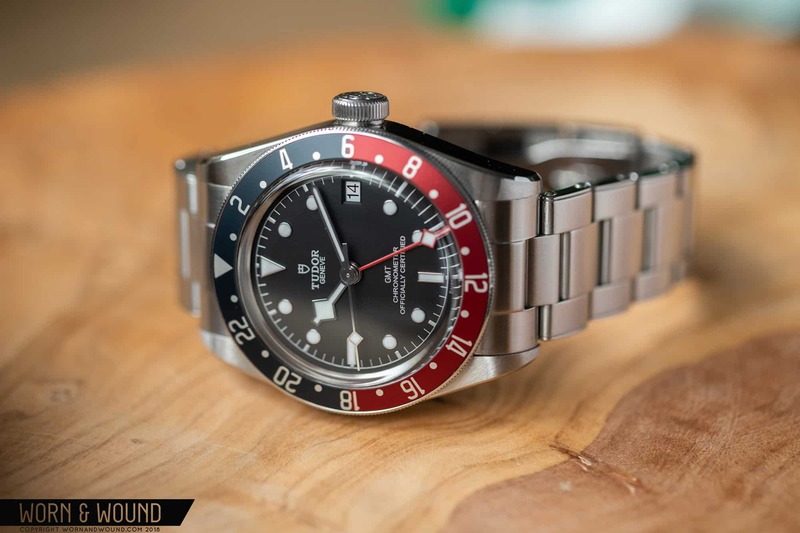 The Black Bay GMT, then, marks a significant shift in strategy, and if what we heard from the good folks over at Tudor remains true in 2019, we can expect more of this to come. Because the denizens of watch-world need something to argue about, I’ve heard some naysayers call the Black Bay GMT a lesser version of the recently-released Pepsi GMT-Master II, Ref. 126710BLRO. It’s not. In fact, despite the shared lineage, these are two wildly different timepieces, and that difference is felt expressly on the wrist. The Black Bay GMT is a luxury watch, no doubt, but unlike most of the references that occupy Rolex’s contemporary catalog, the Black Bay range and the GMT still feel like proper tool watches. Note that above I used the phrase, “true GMT.” GMT watches have long been divided into two camps. The first, and most ubiquitous, is what you get with any watch powered by the ETA 2893 movement. The 2893 features an independent 24-hour GMT hand set against a 24-hour scale. With a 2893, it’s a two step-process to adjust the time after you land in a new locale. You will first need to set the local time on the main handset, and then you will have to reset the GMT hand to home time if that’s what you want to track. For all intents and purposes, these watches get the job done, but are a touch less practical when you’re actually traveling because you have to take a few extra steps to set your watch. As a result, some enthusiasts argue that these are not true traveler’s watches, but I’m of the mind that they get to the same information—just in a slightly different way—and therefore are just as valid. The second and less common of the two is what you get with the Black Bay GMT, the GMT-Master II, and a handful of other watches on the market. These are what people generally refer to when they call something a true GMT. Here, the watch is equipped with a jumping local-hour hand, which is exactly what it sounds like—via the crown, you can jump the hour hand forward or backward (and bring the date with you should you cross midnight) to set your watch to the new local time after you’ve crossed timezones. The 24-hour hand remains linked to home time or any other timezone you’d like to track. I’ve had experience with both of these types of movements, and I’ve owned my fair share of 2893-equipped GMTs. I’ll concede that, ultimately, the Tudor/Rolex approach is more practical if you plan on globetrotting, and I’m pleased that Tudor went with that functionality here. To get that functionality, Tudor developed the MT5652 caliber, which makes its debut here. It comes equipped with a silicon balance spring, 70 hours of power reserve, and it’s COSC-certified. Altogether, the movement is what you would expect from a Tudor not using an ETA-based caliber, and as far as in-house value goes, it’s right up there at $3,900. Off the top of my head, there aren’t any other mechanical GMTs with true GMT functionality near or below this price but for the Alpina Alpiner 4 “Business Timer” GMT, which features a modified ETA caliber. That said, the Alpina definitely has a busier, less versatile look, and I wouldn’t necessarily consider it an alternative. The case here is beautifully done. Just like the the Black Bay Black Ref. 79230N, which Zach reviewed here, what you get with the black Bay GMT is top-notch case work. I’ll echo Zach’s thoughts on the distinct look and finishing of the Black Bay. The tops of the lugs have angled brushing with a visible grain that’s unlike most brushing. In fact, it almost has a pearlescent quality under some lights. The bevel along the top of the mid-case is razor-sharp and creates a beautiful line as it travels along the case and down the lugs where it flares out. Machining and finishing here is as excellent as you’d expect from Tudor. The case measures 41 millimeters wide, 50 millimeters lug-to-lug, and 15 millimeters thick, so it’s more or less in line with the size of the other, larger-cased Black Bay models. The size of these watches has always been a little controversial, and it’s why the new Fifty-Eight enjoyed near-universal praise. But I wouldn’t say that the Black Bay GMT is oversized, and though my sweet spot is generally under 40 millimeters, I did find that I liked the way the Black Bay GMT looked on my wrist. I didn’t at first, and, of course, I would welcome a GMT in the form factor of the Fifty-Eight, but after spending some time with the Black Bay GMT I found that I grew accustomed to its slightly larger frame. I even conducted a totally scientific survey where I asked some friends and family how they perceived the size on me, and everyone said they thought it looked ideal on my wrist. I grew to like the fit on my 7-inch wrist. My real issue with the size of the case has less to do with its diameter and more with its height, and the way that height is distributed between the case back, mid-case, and bezel. All larger-cased Black Bays are very mid-case heavy, and that is often exacerbated by the fact that these watches feature slab, polished sides. It’s divisive, and as I’ve noted in the past, I’m really not a fan of slab-sided cases, especially tall ones. But it seems that Tudor’s design team is receptive to criticism, and one way that the Black Bay GMT tries to offset some of that height is with two brushed undercuts that run along the bottom of the case on each side, ever-so-slightly lessening the effect of the polished mid-case. The impact isn’t massive, but every little bit helps so I absolutely welcome it. I haven’t recently handled any of the current production Black Bays, but I’d be curious to see if these undercuts have been carried over to some of the other 41-millimeter models. The brushed undercuts are a welcome addition to the case design. The bi-directional bezel and crown are solid, and I wouldn’t expect anything less from Tudor. Despite the bezel not being too tall, the teeth are nice and sharp and allow for an easy grip and turn. The crown is large and tactile, and great for interfacing with the complication. Now let’s take a closer look at the bezel. The color scheme is borrowed from two past Black Bay models. The result is a beautiful, subdued color-scheme rendered here on an aluminum base, which gives the GMT a more subtle, tool watch vibe that’s closer to the GMT-Master IIs and GMT-Masters that Rolex produced decades back than anything they make today. If the Black Bay GMT becomes your go-to watch, that bezel is sure to develop a killer patina over time. The dial is matte black and it features large applied markers chock-full of luminous paint. The handset is, as expected, “snowflake”-heavy. In addition to the hour hand and the second hand, the red-painted GMT hand marks the third snowflake hand on the Black Bay GMT, differentiating itself from the arrow hands generally found on Rolex’s GMTs. Once again, it’s a divisive detail, but I’ve grown to like it, largely because you hardly notice it after some time with the watch. I also like how the hand reaches all the way across the dial and lands right by the bezel’s edge. The date window at three is well-positioned and nicely sized—it’s neither too small, nor is it overly large or obtrusive. The date aperture is beveled, and it gives the date disc underneath an attractive frame. Like other GMTs of this nature, the date is not quick-set, which is one of the few downsides of this design. The date can be adjusted quite simply, however, by jumping the hour hand. Fret not, lume fanatics. This thing is a torch. Dial text here is balanced between the upper and lower halves of the dial, and it’s rendered here in a silvery, even somewhat shiny paint. The minutes track along the perimeter of the dial is also printed in silver, and it’s a nice match to the metal surrounds of the hour markers and hands. The overall effect is very clean, and the cool tone of the silver matches the more tempered reds and blues of the bezel. I’m excited to see what Tudor’s design team does with this template down the line. The bracelet shown here is one of three available strap/bracelet options. I always opt to get a watch with a bracelet if one is available because getting one later is often more expensive than getting one from the outset. If bracelets really aren’t your thing, however, then you can get either a leather band with a branded deployant clasp, or a woven mil-style strap direct from Tudor. A simple, yet highly effective clasp. The bracelet has a welcome taper down to the clasp. The bracelet is superb. If you’ve ever handled a Tudor watch, then you’re likely familiar with how solid their bracelets are. I also really love the “rivet”-style design, which, of course, pulls inspiration from vintage bracelets once produced by Rolex and other makers. The clasp is also very nice with extremely tight tolerances, though I still think it’s a miss that Tudor doesn’t use their spectacular Pelagos clasp here (the Pelagos bracelet and clasp are, in this writer’s humble opinion, the best currently on the market, especially for the money). The bracelet does add some heft to the watch, but it also balances the top-heavy head, and I think it makes for a more comfortable watch on the wrist. Shown here on a 7.5-inch wrist.